I am my own worst critic, A.K.A. 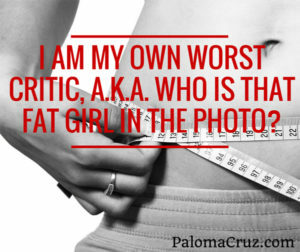 who is that fat girl in the photo? Strangers and acquaintances alike take it upon themselves to try to shame me, to make me understand the way that I’m destroying the world by insisting on being fat. There’s an entire industry (several, in fact) dedicated to trying to solve this problem for me. And I’m told every day, in many many ways, that if I just stopped being fat I would be better, happier. Most days I manage to drown out the external and internal voices that try incessantly to let me know that I’m a failure, that every “extra” pound is one more mark against me. Most days I’m just louder than the voices, so they don’t make an impact on my day. Some days I’m not. I want to have the courage to wear a bright red fitted dress without thinking about the muffin top or the love handles. I want to have the boldness to have my photo taken without dreading the split second where I see just how fat I am compared to the others. I want to stop seeing myself, and judging myself, through the eyes of others. I want to stop it all … now. And I don’t mean that I want to lose weight (though I want that too). And I don’t mean that I want better clothes (though I always want new clothes). I just want to love who I am, in my current size and shape, without having to work at it. I guess when I achieve that I’ll know I’m actually, finally, a grown up. In the meanwhile, I’ve challenged myself to try to take more selfies … and I’ve been failing at that too. But I will get better. And I will keep trying. At some point I’ll stop dreading the photo … eventually.